Last summer our Met Office coordinator Pete Buchanan produced a couple of articles about surface water flooding. In the second article he explained how our Heavy Rainfall Alert (HRA) Tool works. Here he gives us an update on further development of the tool and its operational use. During its first year of operation (2013) and particularly during the summer convective season the tool helped us to identify the potential for surface water flooding. In fact, verification against known events showed a ‘hit’ on almost all occasions. We did however notice some characteristics of the tool, most notably the fact that the probabilities of exceeding the various impact based depth duration thresholds rarely if ever got above the ‘low’ category. 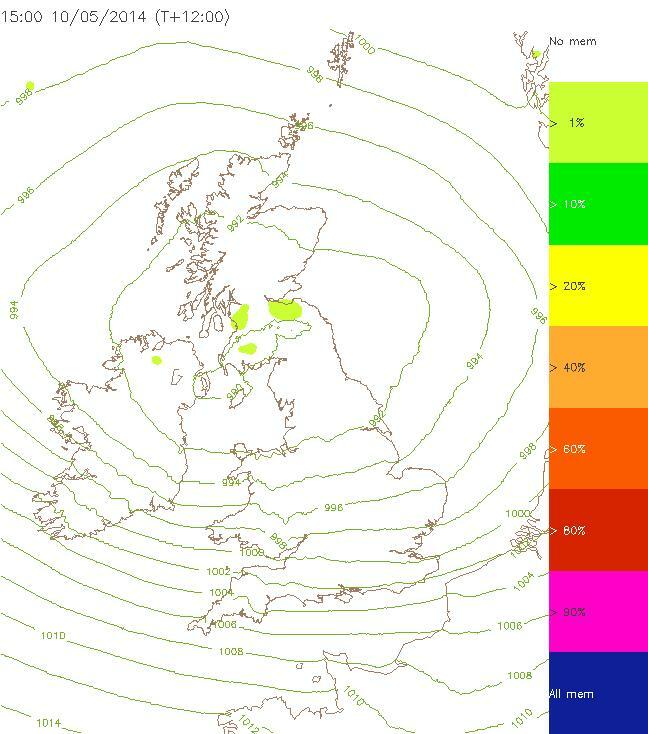 My earlier article also mentioned the development of the tool to use the Met Office’s high resolution, convective permitting ensemble called MOGREPS-UK. I am pleased to say that this development has now been implemented operationally. The ‘raw’ MOGREPS-UK outputs are post processed by time lagging and neighbourhood sampling to better represent the uncertainties associated with small scale convective features. The sort of features which can lead to surface water flooding and flash floods. Early experience of the improved tool suggests that it has more focus and a wider range of probabilities. It certainly helps point to potential issues and the areas most at risk although SFFS flood forecasters and meteorologists still need to look at all sources of information before making the best risk based decisions on a day to day basis. We will continue to monitor the developed tool during the summer convective season and feed back our experiences and impressions to our research and development colleagues. The following case study shows where the information was used to refine the SFFS Flood Guidance Statement (FGS). On 10th May 2014 there was a slow moving and unstable area of low pressure over Scotland with an embedded frontal system and light winds. It is interesting to note that probabilistic forecasts can operate on different scales and, depending on the scale, they will produce different outcomes. The SFFS meteorologists and flood forecasting hydrologists need to put this information into geographical and likely impact contexts in order to develop the overall flood risk. 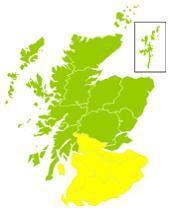 After reference to these forecasting tools and further discussion between the SFFS meteorologist and the SFFS flood forecasting hydrologist, it was decided to issue a YELLOW risk for southern Scotland in the routine flood guidance statement. 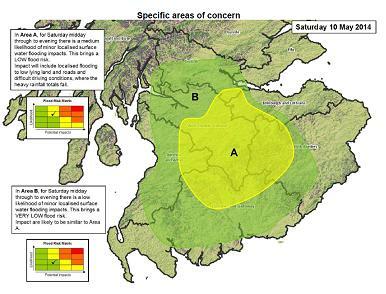 The tools also helped refine the focus of the guidance through the event driven addition of an ‘Area of Concern’ map. What actually happened on the day? Well the afternoon radar picture confirmed the occurrence of some heavy downpours, in the area of concern, and there was a report of a town’s drainage systems not coping with the intensity of the rainfall. Conclusion: The consistent and accurate forecasting of surface water flooding risk in Scotland remains a major challenge for the SFFS. These developments in the underpinning science and technology are contributing to improved performance. 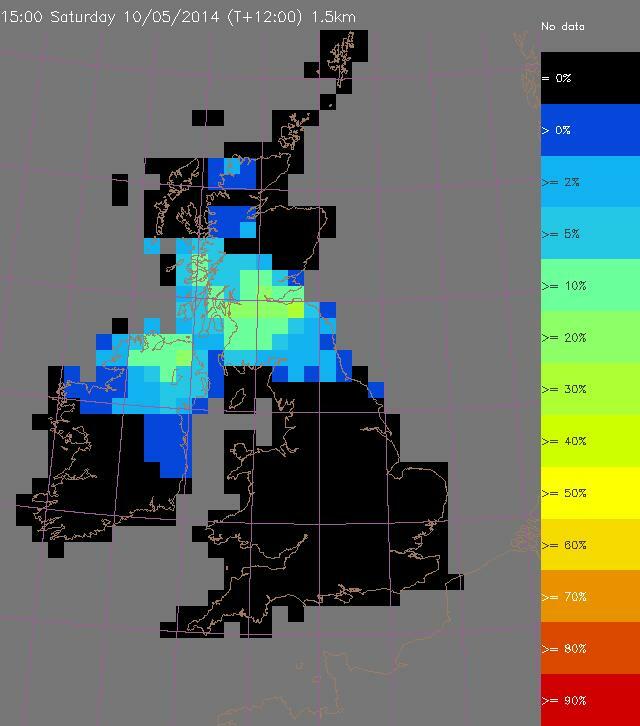 A further demonstration which couples the meteorology with an optimised version of SEPA’s ‘grid-to-grid’ hydrological model is being prepared for the Glasgow Commonwealth games this summer. See our previous article about this for more information. Where do we go from here? We expect further relevant developments in the science and technology behind surface water flood alerting. For example, the Met Office has started the procurement process for its next supercomputer and already there are plans to use this tool to enhance the capability and performance of the associated deterministic and probabilistic forecasts. Watch this space! 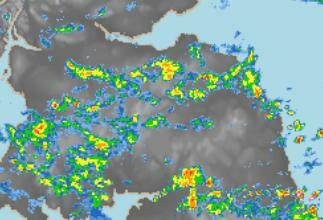 This entry was posted in Flood, Forecasting, Probabilistic, Risk communication, Surface Water, Uncategorized. Bookmark the permalink.